The Betafy Blog | News and notes! If you’re on Betafy, you’ve been in the game long enough to know success is built on more than just a great product. You’ve got to network and market and be so inhumanly persistent, you put door-to-door salvation salesmen to shame. 2. More information about your startup. The Betafy team personally reaches out to interesting startups to interview them and flesh out their profiles. As you can imagine, we have a ton of those, so the process is pretty time-consuming. Beat us to the punch and tell us about you and your product! Some questions we like to ask are: How was your product conceived? What problem does your product solve? What are the most memorable challenges you’ve faced thus far? Is there any advice you’d give your past self – when you were about to start this project? 3. Categories and Subcategories. Choose from a list of pre-existing categories to identify the industry in which your product best fits. Things like ‘Food & Drink’ or ‘Content Management’. You can pick several, just make sure they’re relevant! 4. Any additional Tags and Keywords. Tags and Keywords are very important! They help us match you with beta testers. Feel free to use phrases. 5. Target Audience. This is not the same as categories! In this field, we specifically want to know who you’re targeting. Students? Small businesses? Single people? You have some freedom with this, but define a clear niche so our algorithms can connect you with the right people. 6. Startup/Product Features. Tell us what your product does. What problem does it solve? Why is it so awesome? People love to skim, so give them some good skimming material. Bullet points for the win! 7. Beta User Benefits. Joel Spolsky, Co-founder of Stack Exchange thinks “[every day spent not improving your product is a wasted day. ]” Improvement requires honest, objective feedback and to get that, you’ve got to convince people to test your beta. 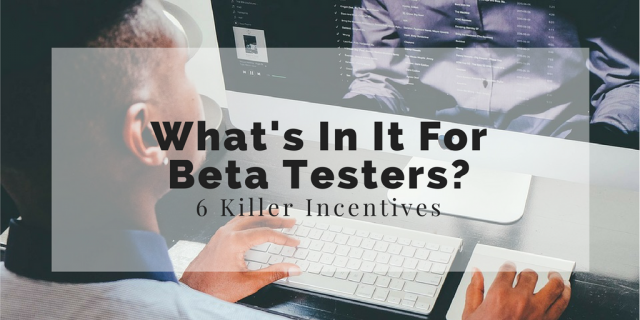 Here are some great beta tester incentives to consider, if you aren’t sure where to start. 8. Media. Upload some images or a screen capture of your application running to pique beta testers’ interest. Visual content is the way of the past, the present, and the future. Give the people what they want! Just do it. 9. Social links. If your startup’s not on social, it should be! Make sure you link to those social pages in your Betafy profile, then share your profile on those platforms. 10. A clear way to reach you. According to a study done by KoMarketing, 64% of people want to see contact information on company websites, even more than they want to read About those companies and 51% think “thorough contact information” is often missing from company websites. Go above and beyond to make yourself available by adding an email address in your profile’s summary. 11. The brains behind the operation. People trust people more than they trust brands, so be sure to add members of your Core Team. Tell us your first names and let us see those beautiful mugs of yours! We’re here to help you get the attention and traction you need. Let us know if there’s anything we can do to help with your profile. * You have a few more than 200 characters for your summary, but only the first 175 or so appear on the listing. Gotta make ’em count! If you’re a five-year-old with a battery-powered Jeep Wrangler that seats one, sharing is kind of the worst. If you’re not, it’s the best thing that ever happened to you. Even amateur marketers know the value and importance of sharing content to social media, but a lot of startups still do it wrong or not at all. What?! We’ve thrown in our two cents to help your startup be so successful, your beta testers draw salaries and smiley faces on all their notebooks. 1. 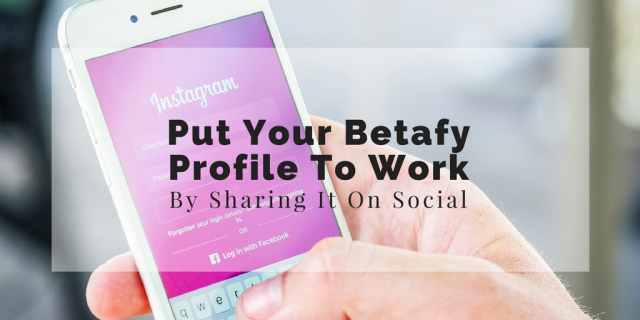 Share your Betafy profile on repeat. Never resort to spamming your followers, but don’t let great content go to waste! Share your best stuff several times to be sure it’s seen by everyone, on all platforms. According to Kissmetrics, a well-executed social sharing strategy can double your traffic. Yes, you read that right. If you want a piece of content to be seen, share it several times. Period. Learn how to effectively reuse content on Kissmetrics and MeetEdgar to get help posting the right stuff at the right time. 2. Customize your posts to best suit each platform. 3. Whenever appropriate, add some oomph to your posts with media attachments. If a picture’s worth a thousand words, a video’s got to be worth, like, a gazillion. So it’s no surprise that 79% of internet traffic will be video content by 2018 (Cisco) or that social media posts with images produce 650% higher engagement than ones with just text (Adobe). I mean, wow. When you let your social networks know you’re on Betafy, add a quick screen capture of the listing or maybe a picture of your team at work. It’s worth the extra time! Here are a bunch of other stats about visual content, the not-so-secret marketing weapon. 4. Always include a clear and captivating call to action. Your high-level goal should influence every single small decision you make. Small decisions like how to word a social media caption or whether or not you should have a fourth cup of coffee. (You know who you are.) We’ll go out on a limb and assume your goal, as a startup, is to get your product in the hands of folks who need it. Beta testers or customers – you’ve got to tell them you exist and get them excited about your product! 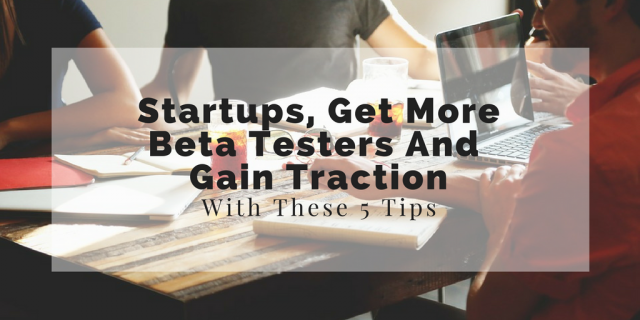 If you’re struggling to attract beta testers to your startup, chances are your Betafy strategy needs a little work. Think of yourself as a marathon runner and your profile as one of those flat escalator things they have at the airport. (That’s the technical term, I think.) It’ll help you work smarter and faster, but you’ve still gotta run. 1. Despite their job title, beta testers are real humans (not robots). Treat them like it. Say “hey” when they first sign up and provide them with any tools they’ll need to be successful. Maybe you have an onboarding packet for them to review. They’re doing you a whale of a favor, so make it easy on ’em. Support them, let them know they’re valued, thank them. Virtual high-fives never hurt either. 2. Consider offering incentives to your beta testers. I mean, who’s gonna say ‘no’ to actual money? It doesn’t have to be money, though. It could be a discount on your finished product or something like that. Of course, you’re not required to offer any kind of incentive, but we do encourage it. Value for value, you know? Right now, it’s only available for web applications, but we’re working on an iOS version in our secret lab. Did I say ‘lab’? I meant ‘bat cave’. The Betafy button closes the loop on beta testing and makes it easier to leave and view feedback in one place. Even non-Betafy members can throw in their two cents when the button is activated! To get it working for you, go to the SDK tab on your listing and follow the instructions. It’s so easy. 4. Share, share, and share some more. We know you know this, but we’ve gotta say it anyway. Share your Betafy listing with your social network and on your website (repeatedly). LinkedIn, meet Betafy. Twitter, meet Betafy. You get the picture. We do our best to get you as much coverage as possible, but this one’s all you. 5. Give your profile a spruce. If you like long walks on the beach with a metal detector, you wouldn’t dream of leaving that off your Tinder profile, right? This is the same thing. The more information you give, the more you’ll get. Introduce yourself and be creative. Identify product features and beta tester incentives, set tags and geographies, link to your social pages, include screenshots and other media showing your software in action. Be the complete package. 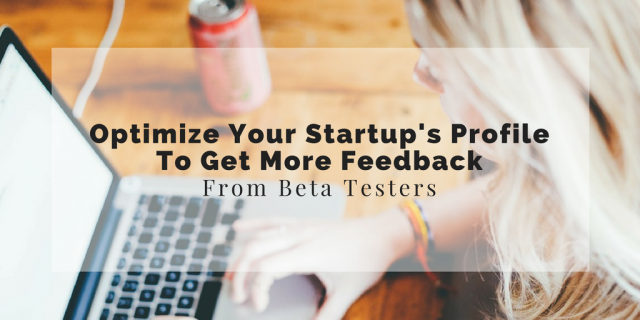 You’ll attract more beta testers and help the Betafy algorithm get you in touch with the right people. Good luck and remember, we’re here for you! Reach out if there’s anything we can do to help. So you signed up to beta test. It kind of goes without saying that you, my friend, are the real MVP. Betafy depends on pioneers, like you, to empower startups and make room for awesome new products. But you might be asking yourself, “what’s in it for me?” We’re glad you asked. 1. Access to unreleased products. You know that lanyard-wearing guy who smugly slips backstage before live music shows? While you’re herded like cattle into the general admission section, he complains about the dressing room catering with the band. When you test with Betafy, you get to be the VIP lanyard guy. No more lukewarm beer spilled down your back. All access, baby! 2. Resume-worthy experience testing software applications. If you’re a part of the tech industry, this experience is a great prerequisite to jobs in Quality Assurance, UX, and UI. Right now, the average User Interface Analyst makes over $74,000 a year, according to Glassdoor. Or maybe you want to develop your own app! Get your feet wet as a beta tester and start learning the ingredients of a successful software application. 3. The opportunity to contribute to something great. If you’ve got the entrepreneurship bug, you value innovation and probably want to change the world. Betafy will help you do that. We want this to be a place where people are inspired and enabled to do great things. 4. A foot in the door at growing startups. A bunch of the startups listed on Betafy will be big names in a matter of years. Their products are unprecedented and the market is poised to eat ’em right up. Giving your time and feedback now could lead to a paid position later, when said startups are hiring. If you’re smart, (and we know you are) you’ll jump at the chance to network with other entrepreneurs on Betafy. 5. Depending on the startup, dollar dollar bills (ya’ll) and discounts. We’re working on a concrete monetization structure to better serve you. In the meantime, we encourage participating startups to offer these types of incentives to their beta testers: paper, Benjamins, cash money, dinero. 6. The smug satisfaction that your opinion is valued and influential. Feel the power. And if beta testing isn’t your thing, you could always pursue food criticism or become a judge on The Voice. We like a little over-confidence around here. It gets stuff done. Make sure your listing is awesome. Make it as complete as you can. Features, benefits, tags, and categories are really important. These will not just tell your likely beta users what’s in it for them, but will also help the Betafy algorithm understand you better. The algorithm will then work better not just at recommending beta users to you, but very importantly, recommending you to them. Oh, also, your social media touch points. Don’t forget to include them in your profile! Make sure to reach out to each of your beta users individually as they join you. First, to thank them; Second, to let them know of any onboarding and/or support info that might make it faster for them to review your beta. Implement the Betafy button on your product. (Currently web apps only. IOS version coming soon.) This will close the loop on beta testing, where beta users can start providing you feedback that gets recorded in Betafy. It will help you see all beta feedback in one place. The Betafy button will also allow you to collect feedback from non-Betafy users and record it. (The Betafy button is going to become even more powerful in the weeks to come, so stay tuned!) Wondering how to implement the button? Go to the SDK tab of your listing to find out how. It’s really simple! Share your Betafy listing amongst your circles. While we try our best to get you as much coverage and traction as possible, you sharing your Betafy listing amongst your circles will help track your traction and beta feedback better. We Got Featured On Product Hunt! Great news! We got featured on Product Hunt! Crazy, right?! We’re currently at #2. This is great validation and reassurance that our notion resonates with our core audience. Thank you for the support! Why Should My Startup Be Listed On Betafy? 1. To help you get the visibility you so badly need. 2. To help you make sense of how your product is being used, so you’ll know how to pivot as soon as possible. Betafy will work with you one-on-one to better understand your goals and help you achieve them. Here’s our easy sign-up for startups! Hello startups! We’ve got an easy sign-up, where you can get right down to creating your listing. Just click the link and you’re on your way. It’s been two weeks since we went live and are happy to have listed out the first set of five startups on the site. We’re working to launch the rest of the awesome startups that have signed up and get their listings just right. We also continue to fine tune more features of the platform – including the SDK – that would allow startups to capture their usage data much better. More updates to follow. Stay tuned! Great news for startups signing up! Two startups among the first 100 startups to sign up would be entered into a drawing to be featured on the first two episodes of BetaTV. BetaTV is a new show dedicated to all things startup by Dallas’s own – Jason Croft. The uber cool Jason has been running Startup Dallas, a wildly successful interview series with over 80 episodes. BetaTV will be an even more awesome offering, providing startups worldwide with the opportunity for valuable exposure that is so needed and yet so hard to come by for early stage companies. Check out Jason’s interviews to get a glimpse of the awesome visibility he’s been providing startups so far. And if you’re a startup and haven’t created your profile yet, you know what to do. Create your Betafy listing now!